When it comes to Thai food, I always rely on bottled pastes (McCormick used to make the best Thai green curry paste) and Nakhon Kitchen which is opposite my house. It has never crossed my mind to cook Thai food at home. As the queue at Nakhon Kitchen gets ridiculously long (at all times), I decided it is time I learn more about Thai cuisine. I started with the simple and basic Pad Thai. Pad Thai is essentially a quick stir-fry rice noodles dish. When I was in university, I would buy those Pad Thai mix from the supermarket. I remembered the sauce was thick, dark and sticky. The finished product was a heavily sauced noodles. A good Pad Thai should embody spiceness (chilli powder), sourness (tamarind), sweetness (palm sugar) and saltiness (fish sauce). The end result is a flavourful, substantial plate of noodles. I also did my research on Pad Thai, and realised everyone has their own version for the sauce, preparation of the noodles and so on. 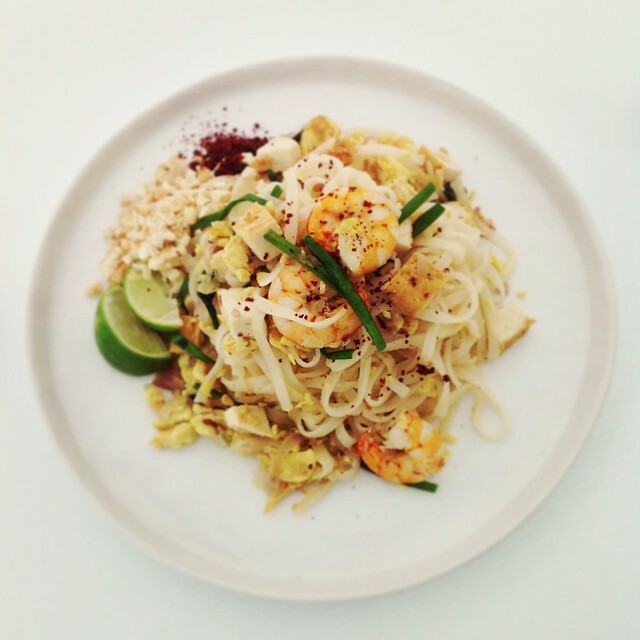 The first time I cooked Pad Thai, I felt it was lacking acidity. I made some adjustments and was quite happy with my second attempt. I am glad that Pad Thai has made it into my small repertoire of dishes that I know how to cook. - In a large bowl, soak the dried rice noodles in cold water for about 15 minutes or until they have soften (make sure the noodles are completely covered in water). - While the noodles are soaking, you can start to prepare the sauce. In a small bowl, mix the sugar, tamarind water, vinegar, fish sauce (or soya sauce) and 1-2 tablespoons of water. Mix until the sugar has dissolved and taste. The sauce should be balanced. If need to, adjust the flavour accordingly – sweetness (sugar), saltiness (fish sauce/ soya sauce), and sourness (vinegar or tamarind water). Set aside. - Once the noodles starts to soften, bring a pot of water to boil. - Drain the noodles and add them in the pot of boiling water for less than a minute. The noodles should have firmness, and not mushy. Once cooked, drain the noodles and set aside. This will help to prevent the noodles from clumping when being stir-fried. - Place a wok over a medium heat. Add in the oil and let it heat up. Once the oil is heated, add in the shallots and fry them until they soften, coloured and develop fragrance. Once the shallots are soften, add in the prawns (if using). - Once the prawns are added, pour in the eggs. Like cooking an omelette, tilt the wok and using a spatula, push the egg inwards so that the egg that is seated inside will be moved and get cooked. - While the egg is still runny, increase the heat to medium-high, and add in the drained noodles. Fry for about 30 seconds and at the same time, break the eggs using the spatula. Add in the sauce, and fry the noodles to ensure the sauce is evenly distributed. - Once the sauce is absorbed by the noodles (it should take less than a minute), add in the beancurd, chye poh and ¾ of the cashew nuts, and continue to fry the noodles until it is almost dry. At that stage, add in the Chinese chye and fry for a few seconds. - To serve, divide the Pad Thai into 2 plates and garnish with the remainder cashew nuts, roasted chilli powder and lime wedges. *To obtain tamarind water, you will need 2 tablespoons of tamarind pulp and 2 tablespoons of warm water. This should yield around 3 tablespoons of tamarind water. Before mixing the tamarind pulp in the water, rinse the pulp to remove any surface yeast. Once rinsed, mix the tamarind pulp with the water and let it soak for a few minutes. Once the pulp is soften, using a spoon, smash the pulp so that it dissolves in the water. Pass the mixture through a sift, and using the same spoon, squeeze out as much juice as possible. Don’t be terribly worried if the tamarind water is rather thick, you can easily dilute it with water. Any leftover tamarind water can be kept in an airtight container and place in the fridge for 2 days.